This book, published in 2002, is of interest because it gives an insight into the ideas and values of Steve Hilton, the man who does strategy for David Cameron. Steve Hilton argues that brands can make a contribution to social progress. He and his co-writer Giles Gibbons put the capitalist case against anti-capitalists such as Naomi Kline, Noreena Hertz and George Monbiot. This is done well. A job is a wonderful thing wherever you are in the world. It gives you freedom. Capitalism has delivered higher living standards, better healthcare and lower mortality rates. Successful corporations contribute vast sums towards public services through taxes. They’re not perfect, but they do what they do very well. Hilton is hip and the he writes in that chummy way that the Innocent fruit drinks brand talks to their customers. But that’s not necessarily bad, Innocent is popular. Hilton has researched the activities of small organisations and the alternative business gurus. He advises charities and social entrepreneurs not to approach corporations with a begging bowl, they should identify where social objectives overlap with the commercial interests of the company and look for where both can benefit. He makes the point that big businesses have to behave well. The internet enables NGOs and pressure groups to expose reckless companies and they will damage your shareholder value if you behave in a cavalier way. McDonalds now farm their cows to impeccably high standards. When big companies deal effectively with criticism and clean up their act, the anti-capitalists haven’t got a case. It’s worth pointing out that corporate social responsibility is not new. Marks & Spencer introduced canteens because their employees were undernourished. Barkers, the Kensington retailer, had a sports ground and organised dozens of sports teams. They did it not out of altruism but because there was a business case. Where Hilton gets into a fuzzy area is when he employs the word ‘help’. What keeps businesses sane and sensible is that they provide services for money. We value what we pay for and pay for what we value. When he says, ‘Sky believed it could help’ (with careers advice for young people) or when Deptford needed to attract new businesses, Saatchi and Saatchi could ‘help’, the nature of the contract changes. He cites a campaign that Coca Cola ran to give away books. But what type of books? Did they actually get read? Did they remain in big piles in the depot? Hilton advocates that companies need to offer social leadership. Identify ‘good’ social causes and extend their brand accordingly. BP is the obvious example and you can see where ‘Vote Blue, Go Green’ came from. I wasn’t utterly convinced that corporations will want to champion social progress. I remember one of those corny self-help book lines, ‘If you want to make enemies, try to change something.’ The most innocuous social projects upset some people. Social change is often very messy and costly. That makes improving the world a risky strategy. A good quality in politicians, is that they put up with being ridiculed and despised, and struggle on. They have beliefs. Corporations maximise shareholder value. Surely you choose to work in a corporation so you can go home at a reasonable time and have your weekends free – you don’t have to deal with the lunatics, idlers, incompetents and troublemakers that politicians have to listen to. In business you sack them. The final chapters advocate some wacky schemes. The Olympics should have a Truce Week. The idea is that during the Olympics all countries in conflicts should be persuaded to cease hostilities, like when they played football in the First World War. A music brand should take up the problem of engaging young people in politics. ‘Why not encourage young people to write their own songs about the social issues they care about today?’ - the winners could have their songs distributed free on the internet. These suggestions had me thinking that Steve has been watching too many Richard Curtis movies. One bit I really liked. He identifies the psychological ‘compartmentalisation’ flaw of the ‘Old’ Right, when he describes a businessman who was most reluctant to take his daughter to work as part of a special initiative, because he realised that he was in fact two different people. At home, a loving compassionate father; at work a ruthless bully. "A new generation of senior executives, many of them with socially liberal values established during their formative years in the 1960s, and, crucially, many of them women, is starting to change the conventions of doing business". Well, they have changed politics too. The politicians who don’t realise this still wear the pin-stripe suits, the ones who do have the open neck shirts. The narrative is suffused with a cool, laid-back yearning for a better world. 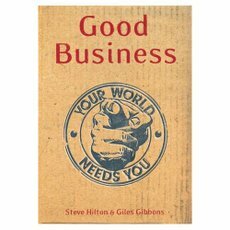 Steve Hilton has run a successful consultancy called Good Business, which advises companies on these issues. Brian Jenner runs a blog on the subject of speechwriting. Hilton's a brander - a generaliser - someone who thinks about the veneer but knows little about the substance. For example, businesses cannot sack the lunatics, the idlers, the incompetents, the troublemakers any more - thanks to social regulation. Many employers are using the opposite technique of sacking themselves to escape the horrific prospect of being saddled with such folk. If you sack such folk, they can spend years suing you and negotiating nice payoffs. Few people want to live like that. There are more and more people like Hilton who leave the core of real organisations that have to deal with such issues, and go out and preach. It doesn't solve the main problem - that business is so circumscribed with laws and regulatioin now that people are giving up running them. That's why unemployment is rising....big business create no net jobs by the way. Only small companies actually create jobs. Business is already totally overburdened with red tape, and it gets worse by the day. Unless that is dealt with, the aspirations of Built To Last - that business people will assume more responsibility and become enterprising is doomed to failure. Of course if people do want to run businesses successfully, and take on the burdens of society once more, the effect of modern media is such that firms are inevitably becoming more aware of current issues and fashions of the kind mentioned. But to be honest, the traffic is all the other way now. Business people are getting sick and tired of the way society works, and they couldn't really give a fig about assuming more load and joining in with some sunny preacher's nice little ideas. Ascribing old fashioned compartmentalism to the 'Old Right' is nuts. All people from all classes and political beliefs lived compartmentalisied lives then. Work was far more boring in those days pre - communication technology. When 5 o clock came, you shut the factory door and went home and started to live. Now work can be more interesting with the drudgery removed, combined with instant connection to the marketplace. I am sure Hilton is a good brander, but he does not express the desperation of business people and the urgent political needs of business. The paintwork will be done well by Hilton, but the engine of business is labouring heavily and needs major servicing - or it will stall. He can only keep his light laid back approach to business by ignoring that reality, and it makes him a weak force where a strong one is required. If he wants his ideas to be Built To Last, he must address the current grim reality of excessive regulation. Or the only social leadership provided by business will be a lengthening unemployment queue.